The challenges newly hired faculty face can be daunting, but you don’t have to face them alone. Please join us for the PSC’s Junior Faculty Development Day Friday, April 5 from 10:30 a.m. – 4:30 p.m. It’s a day of workshops and presentations from department chairs, grievance counselors, newly tenured faculty and union officers organized to help you navigate the tenure process and utilize the resources available at CUNY to support your scholarship. The union is here for you. The misrepresentation of the PSC's position on the question of a strike has to stop. "7K or Strike" is not the position of the union. Some members who have participated in "7K or Strike" events have done so because they want to open up discussion of whether a strike is the right tactic for this moment, or because they believe they are advancing the union's contract campaign, or simply because they want to show their support for adjuncts. All of these positions are valid. But a relatively small group of "7K or Strike" proponents has attempted to confuse colleagues and the media about the union's position. This letter is addressed to them. Please let your students know about the following event THIS WEEK: Thursday, 3/21, Patio Room, 1 PM, Higher Education Forum with Senator Toby Ann Stavisky, who both represents Queens College AND is the chairperson of Senate Higher Education Committee. This is THE opportunity for OUR students to give testimony to the senator as negotiations with Governor Andrew Cuomo over financing for CUNY and Queens College take place during the next two weeks. New York, NY—Faculty and professional staff of the City University of New York escalated their fight for a fully funded union contract today with double-header rallies outside the Governor’s NYC office and City Hall as City and State elected officials negotiate their budgets. 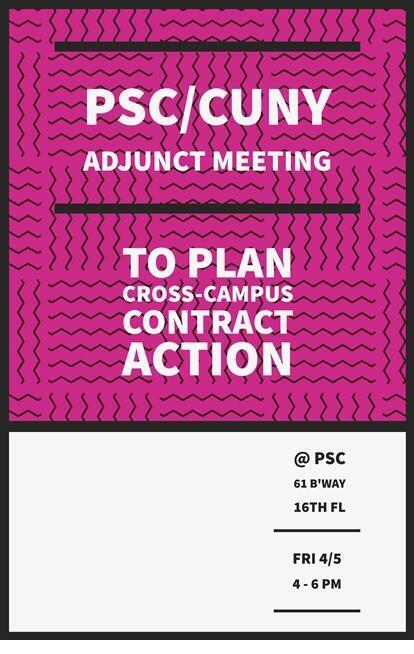 Thirty thousand CUNY academic staff have been working without a new contract for fifteen months; 12,000 are adjunct instructors, who teach the majority of courses but earn a near-poverty wage. “We’re here to tell Governor Cuomo and Mayor de Blasio that CUNY students deserve better than exploited, underpaid workers in understaffed departments and offices. Albany and City Hall must provide the funding for a fair contract with decent raises for all CUNY workers and $7,000 per course for CUNY adjuncts,” said Barbara Bowen, Ph.D., president of the Professional Staff Congress, the union representing faculty and staff at CUNY. The PSC is proud to endorse Jumaane Williams for Public Advocate in the February 26, 2019 special election. Jumaane is a graduate of NYC public schools and CUNY He graduated from Brooklyn College with a BA in political science and Masters in urban policy. He was first elected to represent City Council District 45 in Brooklyn in 2009 and was re-elected in 2013 and 2017. Prior to his election, Jumaane served as director of Tenants & Neighbors, a statewide tenants’ rights organization.